House & Garden unlocks the door to an array of unique homes and outdoor features, ranging from town houses and converted barns to fabulous modern apartments and island retreats. Outdoor features are equally varied, including cottage gardens, water gardens and chic, city courtyards. 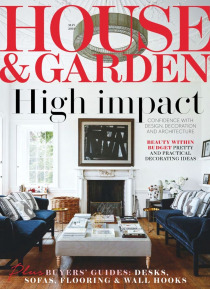 House & Garden provides an invaluable sourcebook of ideas, from design and decoration to the best of travel, deliciou… s recipes and fine wine. Britain’s most glamorous, inspiring and influential design and decoration magazine.